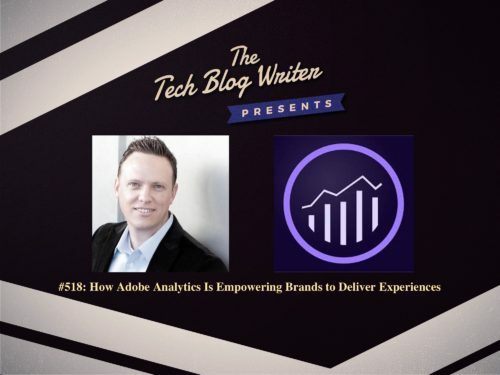 Long time listeners will remember that way back on episode 223, I had the pleasure of talking to Jeff Allen, the Senior Director of Adobe Analytics here on the Tech Blog Writer Podcast when I met him in Las Vegas. At the Adobe Europen Summit, I bumped into Jeff on this side of the Atlantic and thought it would be a great chance to gran him for a quick catchup chat and thought I would invite you all along to eavesdrop on our conversation. The last time we met I spotted 6 NBA Hoops games. I quickly noticed that anyone approaching these games machines was advised to scan their registration pass and it seemed their game seemed to populate a metrics dashboard. It was at this point I discovered that after the announcement of the Adobe Analytics cloud to serve the experience business. Adobe wanted to find a way to simplify the complex world of analytics by showing every user how much data can be obtained by a simple game of NBA Hoops. Giving the attendees an opportunity to see a real-time dashboard game visualization with an enormous amount of data enabled anyone regardless of their position to instantly understand the power of Adobe Analytics. Jeff Allen helps navigate around buzzwords, algorithms, and models so you can get to the essence of how data science can move the needle for your organization and can even highlight that via the medium of the NBA Hoops arcade game. Jeff talks about the challenges retailers are facing with not knowing their customer or their behavior, likes and dislikes across all channels and the problems that can cause. Many people can visit a retailer on a website, mobile app and in a store, but if these experiences are not joined up, the service they receive will suffer. We also discuss life in a post Cambridge Analytica world and how businesses need to build relationships, earn trust, and deliver superior experiences without being creepy about it.